You can be confident that your belongings are stored in a high security environment. State of the art systems and procedures are in place at all our sites. It's a huge saving and one less thing to arrange. We offer the use of either a Rent-A-Store truck or trailer for your initial move in to our facilities. Enjoy a hassle free experience. We employ efficient, clear-headed and enthusiastic staff to make Rent-A-Store the name you will recommend in self storage. For your convenience, we stock all the packing essentials you'll need at our Packing Supplies shops located at each of our sites. for your convenience, packing supplies are available for purchase at Packing Supplies shops located at our site offices, or online. Moving house? Garage filled to capacity? Or simply need extra storage for your business goods. Rent-a-Store offers secure and convenient public self storage facilities in Gauteng. Household items, furniture, excess stock, bulk purchases, office records, trailers, vehicles, boats, sporting equipment... you can store it all. Our storage units come in various sizes, including lockers; mini storage and larger garage type units, so that you only pay for the extra space you need. Maintaining a safe and secure self storage environment is a priority at Rent-a-Store. You'll also find our staff friendly and helpful, our facilities fresh, clean and tidy, with units that are accessible, even if you're moving goods in with a large truck. 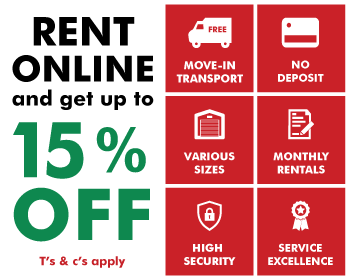 For quality storage at affordable rates, with no deposit required, plus loads of value-added specials, look no further than Rent-a-Store. We've been in the storage business for over a decade, and provide tips on how to pack your storage unit for maximum benefit, and ensure that your goods are accessible and stay in good condition. And we've even gone one step further, to make the packing supplies that we know will help you move and store well, easily available. View our online catalogue, or visit our moving and packing supplies stores located at our storage sites.